Middlesbrough is an exciting and vibrant town. It has all the facilities you would expect from a large town with inexpensive accommodation, a wide variety of shops, theatres, art galleries. museums, pubs, nightclubs and entertainment. 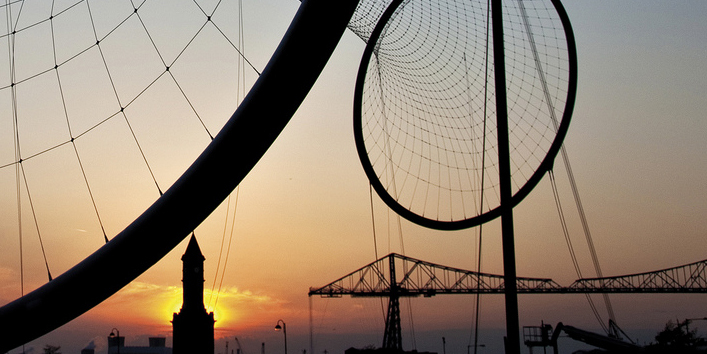 Our new accommodation guide lists all the top places to stay on your visit to Middlesbrough and our new Restaurant Guide lists all the best places to wine and dine. The Mall is home to big names including H & M, George, Topshop, Footlocker and HMV. The Town Hall is ideally situated at the heart of the town centre and is very convenient for the bus and train stations. The Empire is a beautiful converted art deco Victorian Theatre with a 70m sq stage with extensive stage wings for production/mixing points. Temenos is the first of five huge sculptures that will be built in Teesside and Co Durham. Temenos, will be built on the North East corner of Middlehaven Dock. The Dorman Museum offers a great range of eight themed display galleries, full disabled access throughout and additional facilities such as cafe, on- site collection stores, resources room and education suite. In the heart of Middlesbrough's shopping district, this elegant mall offers great variety in an attractive environment.